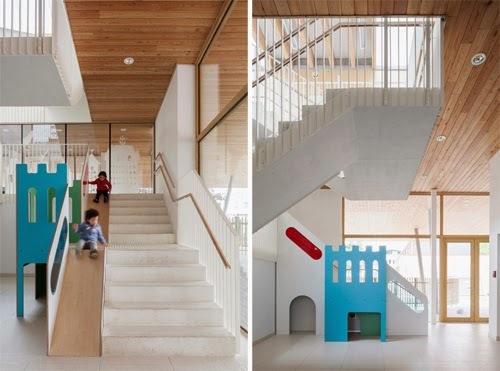 Hakusui Nursery in Chiba, Japan designed by Yamazaki Kentaro Design Workshop makes use of it's gently sloping site by creating large terraces or steps providing both physical fun and different zones for different activity. Interspersed with these "steps" are custom-designed platforms (stages), cubbies, railings and enclosed "pods" for more quiet or private activity. 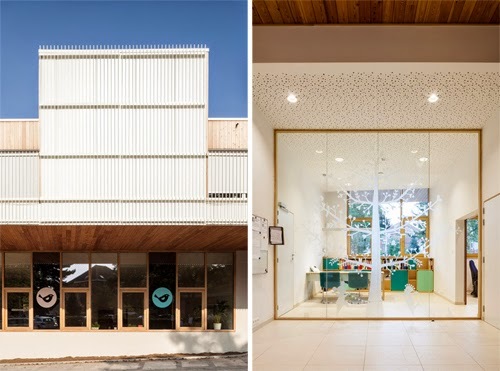 All sides of the steeped centre are characterised with floor to ceiling glass and large sliding windows and doors enabling fresh air, sun and access to the outdoors for play. 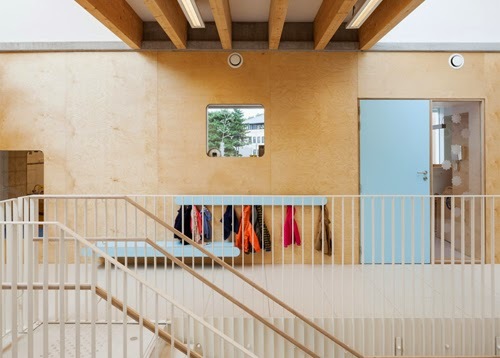 Natural ply is used for the floors and "steps" while pine is used for the many and varied structural columns - creating an effect like being in a forest. Appropriate for it's location next to a large wooded mountainous park nearby. 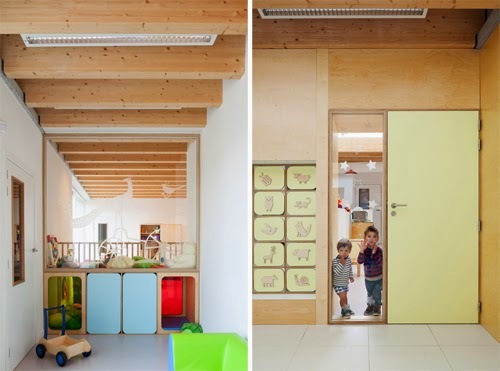 Colour is used sparingly giving identity to the various enclosed "pods" or rooms. 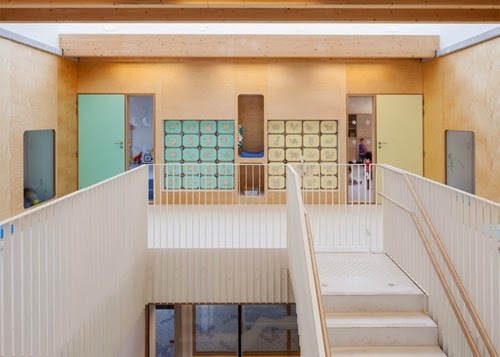 A unique feature of the nursery is the way the sloping roof collects rainwater and lets it gush over the edge of the roof as a waterfall - providing a fun water play area for the children. 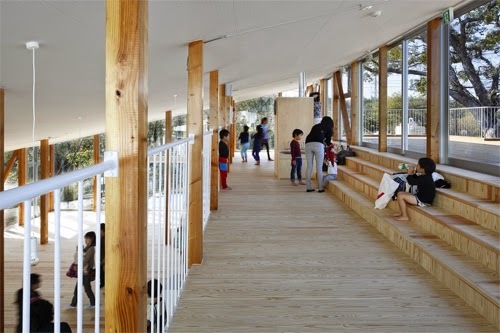 On the top most side a large deck is also provided further encouraging the use of the outdoors for healthy play. 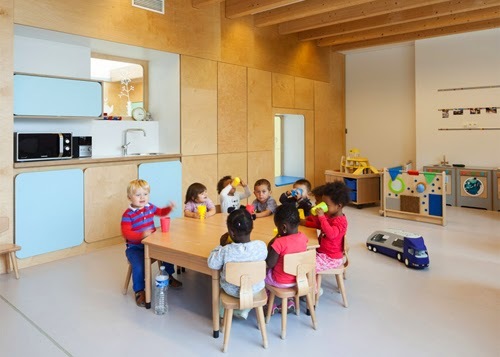 Designed by ZAmpone Architectuur, the Pluchke (or "fluffy" in English) Daycare Centre is thoughtfully designed in considering the views of the building's young users. 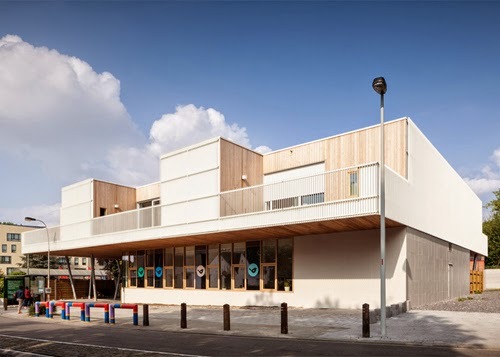 Situated in Belgium's Brussels, the now 75 child-capacity centre was to replace an older and tired centre catering to 35 children. 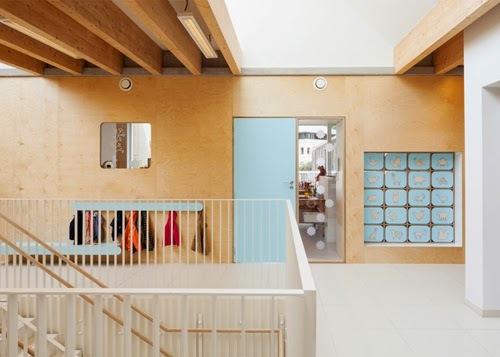 The small site situated in front of a primary school was fully utilised by placing the daycare on the level above ground. Thus maintaining the street level for the public and the centres' administration spaces. 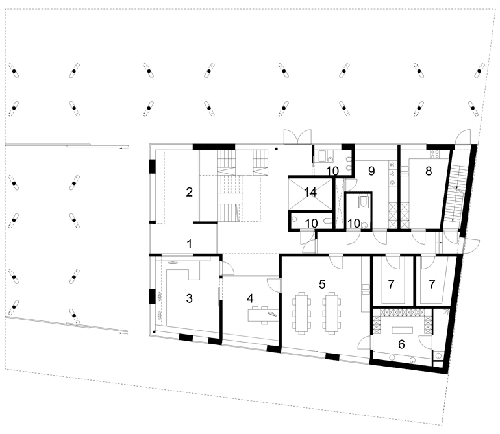 Six "living rooms" (group rooms or classrooms) each with their own outdoor terrace surround a central sunlit atrium and circulation space. 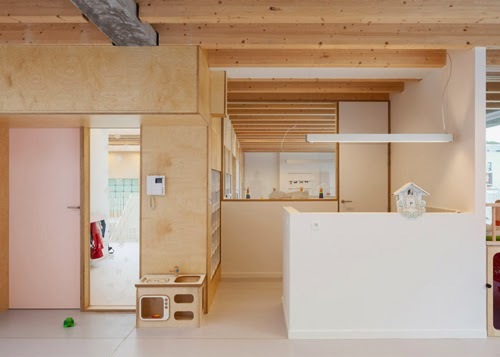 Thus connecting all of the spaces visually and physically. The stairs also exhibiting a slide and playground - making the journey from up to down fun! 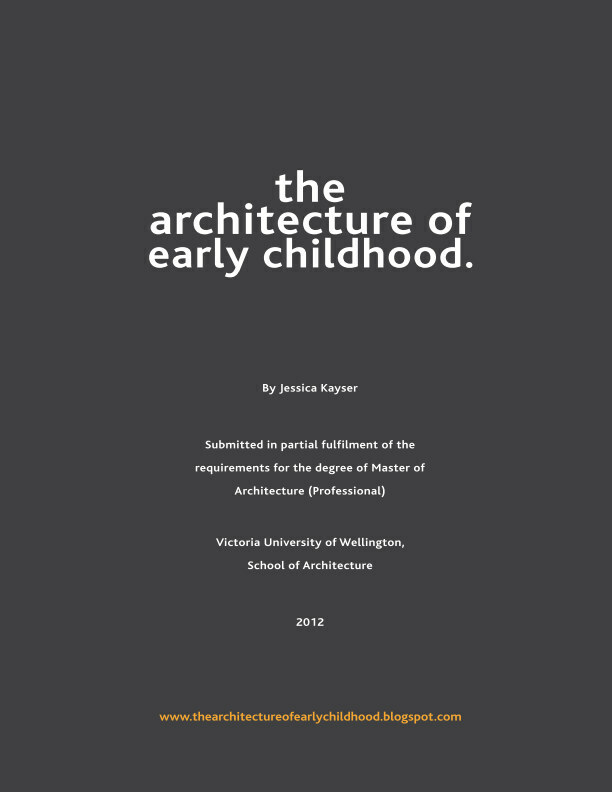 The architects cleverly considered the scale of the child in all instances. 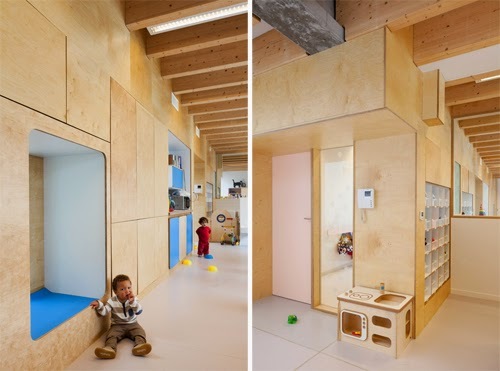 Offering a multitude of spatial experiences as well as furniture and hooks that can easily be used by the child. Furniture and cabinetry is all custom designed - maximising the available space. 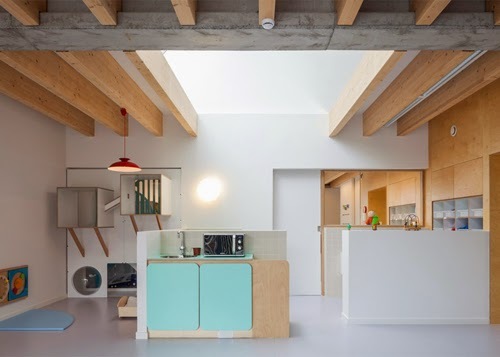 Light timber, concrete, steel and muted paint colours are combined to create coherency and visual interest. 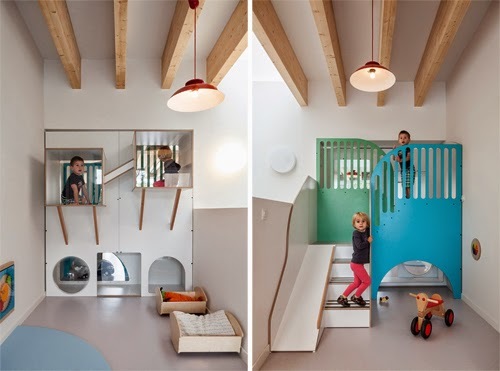 Nooks are provided for children to hide away in for rest or play. While hanging light fittings give a homely feel. Above, a view to one of the outdoor terraces is provided with a window nook. 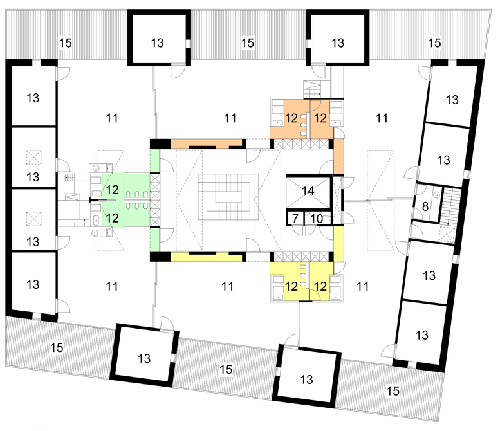 A longitudinal section through the building shows the use of light wells offering an abundance of natural sunlight into the internal spaces. Never heard of Bloglovin? I love it, as now I can read snippets of information from my favourite blogs that I like to follow and choose what I would like to delve into further. Try it out!